To a life without regrets! Back on the starting line! Ven. 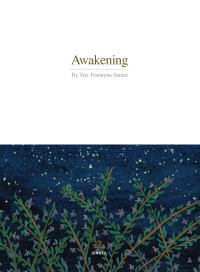 Pomnyun Sunim, who has been passing wisdom on how to live a happy life through books such as Wisdom for Newlyweds, Lessons for Mothers, and Prayer has published Awakening, an English translation of his book Enlightenment – Opening Our Eyes. Most people live their lives habitually with their eyes closed without knowing what it means to be mindful in the moment or why they should do so. Ven. 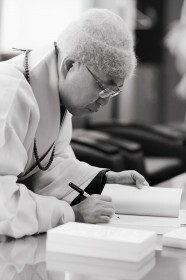 Pomnyun Sunim tells us that it is possible for all of us to live a life of happiness and freedom regardless of the situations we are in, but to make that possible, we must first “open our eyes.” Instead of using conceptual and philosophical terminology, Awakening conveys teachings of the Buddha with specific and vivid everyday language. Through the short stories in the book, we get an opportunity to deeply reflect on our lives and ourselves. When we examine ourselves according to Ven. Pomnyun Sunim’s teaching and practice being awake to the present, we are able to perceive correctly what a meaningful life may be. Only then do we finally realize how futile life is. Then, we can replace the futile life we have been living with a life of happiness. Our life up until now is practice. Now, we begin a new life. Ven. Pomnyun Sunim showed us the path to self-transformation with Prayer, a book well-known for the fact that Buddhist monks read it first and recommend it to laymen. In the new book, Awakening, he talks about being faithful to the present moment. Many of us either cling to the past or worry about the future. This is not because we don’t want to live in the present. Rather, we live habitually with our inner eyes closed without knowing what it means to be mindful to the present and why we should do so. Then, we complain that the world is dark and that we are not happy.” Ven. Pomnyun Sunim says that if we are not happy in this moment, we should “open our eyes” first.” He imparts his teaching on “mindfulness” with specific and vivid real-life language rather than with conceptual and philosophical words. We should choose to live a life that’s joyful both at this moment and as we look back on our lives. When was it that you felt content and proud of yourself? Was it when you were looking out for your own interests, or was it when you went out of your way to help your family members or friends? Isn’t it true that you remember the time when you were helpful to others as the proudest and most rewarding moment? At the end of the day, didn’t such a moment actually end up benefiting you the most? 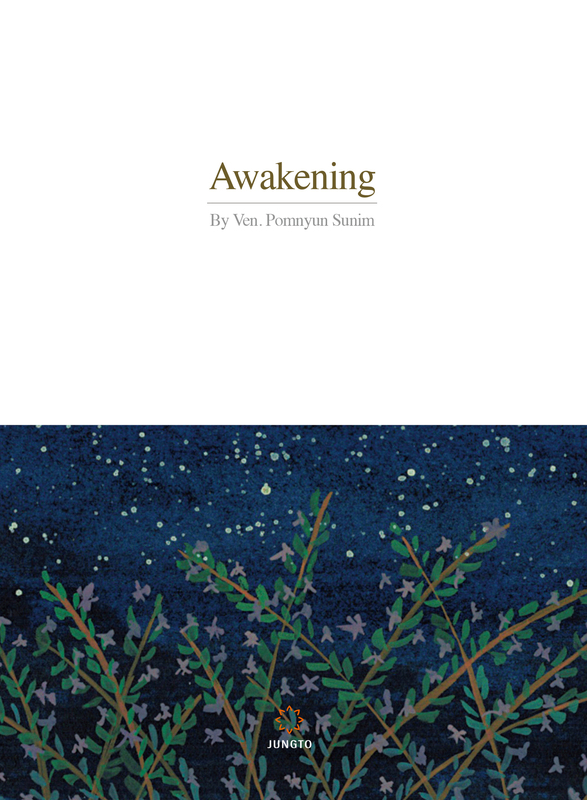 Through the short stories in the book, Ven Pomnyun Sunim presents us with an opportunity to deeply reflect on our lives and ourselves. Accordingly, when we look inside ourselves and practice being mindful in the present, we can correctly perceive what is a meaningful life and what is a futile one. When we truly recognize the difference between those two, we can choose to pursue a meaningful and happy life over a futile one, so it is urgent that we “open our eyes.” Only when we do so, can we help others also awaken and open their eyes. This book helps us realize that this is the meaning of “attaining enlightenment and liberating all unenlightened beings,” the wisdom that the Buddha imparted to us a long time ago. Once we open our eyes, the world is already bright. Some people ask me, “How come you just give advice to people about their lives, laughing with them or scolding them instead of delivering Dharma talks about the profound teachings of the Buddha.” However, that is not accurate. I scold people when they stubbornly hold onto the views that go against natural principles, so that they can awaken and see their surroundings. Happiness is always with us in the same way that the sun shines down warmly in the spring. However, if we close our eyes or stay in the shade, we will complain that it is dark and cold. Once our eyes are open, all of us will see that the world is already bright. 후회없는 인생을 위하여! 다시 새로운 출발! 이제까지의 삶은 연습이다. 지금부터 새로운 인생의 출발이다! 법륜 스님의 <깨달음>이 영문으로 출간되었다. 많은 사람들이 지나간 과거에 매달리거나 아직 오지 않은 미래를 상상하며 두려워한다. 현재를 살고 싶지 않아서 그렇다기보다는 이 순간에 깨어 있다는 것이 어떤 의미인지, 왜 그래야 하는지 알지 못한채 마음의 눈을 감고 습관처럼 세월을 보내는 것이다. 그러고는 세상이 어둡다고, 행복하지 않다고 아우성이다. 법륜 스님은 이 순간 행복하지 않다면 무엇보다 ‘내 눈을 뜨는 것’이 먼저라고 말한다. 지금 ‘깨어있음’에 대해 관념적이고 철학적인 말 대신 구체적이고 생생한 현실의 언어로 가르침을 전한다. – Where Are You at This Very Moment? – Have You Ever Seen a Stone Float on Water? 지 난날을 돌아보면 자랑스럽고 만족스러울 때는 언제였는가? 내 자신을 위했던 때인가, 아니면 내가 조금 어렵더라도 가족을 돕고 친구를 돕고 남을 도왔던 때인가? 남에게 도움이 될 때가 오히려 더 자랑스럽고 뿌듯한 일로 남아 있지 않은지. 결국 그러한 일이 결과적으로 나에게도 더 이롭지 않았는지. 법륜 스님은 짤막한 일화들을 통해 지금까지의 내 삶과 현재의 나를 들여다볼 수 있는 깊은 성찰의 시간을 갖게 한다. 스님의 가르침을 따라 자기 내면의 들여다보고 지금 이 순간 깨어 있는 연습을 통해 우리는 가치 있는 인생이 무엇인지 바르게 인식할 수 있게 된다. 헛된 삶이 무엇인지 그때서야 비로소 알게 되는 것이다. 그것을 바르게 인식할 때 그동안의 헛된 삶을 버리고 가치 있는 삶, 행복한 삶을 살아가게 된다. 지금 여기서 ‘내 눈을 뜨는 것’이 절실한 까닭이다. 감았던 눈을 뜨고, 무엇이 헛되고 무엇이 가치 있는 삶인지 바르게 알 때, 우리는 비로소 세상을 위해 불을 밝히는 노력을 할 수 있다. 이것이 상구보리 하화중생, 붓다가 오래전에 우리에게 전한 가르침이라는 것을 이 책은 깨닫게 해준다.